View of “Poorly Watched Girls,” 2018–19. Valley is an eight-channel video projection in which eight “strong women artists” (Bocanegra’s words) simultaneously reenact Judy Garland’s wardrobe tests for Valley of the Dolls filmed just before Garland was fired (presumably due to being intoxicated on set) from the 1967 movie. 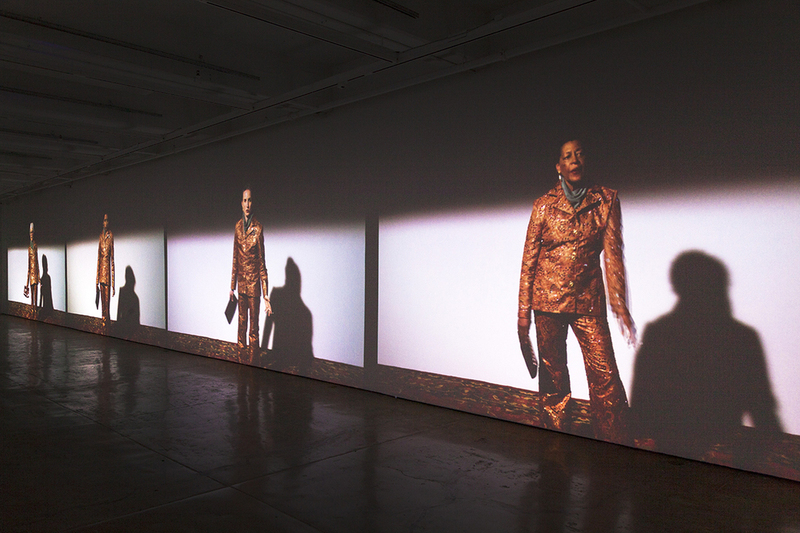 These women include Joan Jonas, Tanya Selvaratnam (who, earlier this year, publicly disclosed physical abuse by a partner), and Carrie Mae Weems. Dressed alternately in orange-and-gold tasseled caftans, fire-engine red skirt suits, paisley pantsuits, and white lamé bell-sleeve dresses, the artists act drunk or high, unsteadily turning on their heels. They quip, whistle, wave, and giggle in near unison, remaining self-assured even as they inhabit Garland’s fragility, a fragility that was, in fact, the basis for one of the central characters in the film. Dialogue of the Carmelites is contained in a darkened room, each wall lined with spotlighted shelving that displays a series of pages cut from a 1955 guide to Catholic orders, each featuring a black-and-white photograph of a nun wearing her order’s habit, emblazoned by Bocanegra with rich purple, black, and white needlework. A sparse soundtrack of high, harmonizing voices rings out from four corner speakers in a reworking of Francis Poulenc’s 1953–56 opera about the murder of a whole convent in Revolutionary-era France. The pictures of nuns face one another and the viewer, as if congregating to assert the personhood and community denied to their sisters—and urging the viewer to do the same.